Outlaw Pete (g. by Oratorio). 3 wins. See below. Strike Drone (g. by Oratorio). Winner at 1700m in 2014-15 in Aust. UNDER THE EIFFEL (Mossman). 9 wins-1 at 2-from 1100m to 1600m, A$618,231, MRC Sandown S., Gr.3, TTC George Adams P., L, MRC Sky High Mt Dandenong H., Swan Hill Cup, VRC 7 News P., MRC New Litho H., Premier Signs H., 2d MRC D'Urban S., Gr.2, Victoria H., Gr.3, John Dillon S., L, Sunshine Coast Guineas, L, MRC Bib Stillwell BMW H., 3d VRC Chester Manifold S., L, MRC Wayne Beauglehole H., MVRC Drain Man Premium H., 4th Newcastle JC Newmarket H., Gr.3, MRC Anniversary Vase, L-twice. TOWER OF LONHRO (Lonhro). 13 wins from 1200m to 2100m, A$443,293, to 2014-15, WATC Grandstand Cup, L, Crown Perth H., Nominations Closing H., Brian O'Malley 80th Birthday H., Skyy Vodka H., Diggers' Cup, Budget Business Club H., Ramelius Resources H., MRC (Mornington) Red Rooster P., 2d WATC York S., L, Computer Recycling H., 3d WATC Hyperion S., Gr.3, Strickland S., Gr.3, MRC Melbourne Truck Centre H.
Alright Already. 9 wins-1 at 2-from 1000m to 1950m, A$142,140, 2d ATC Edgecliff H., Australian Turf Club at Kembla H., 3d AJC Hickman Racing H., ATC Sydney Carnival H., STC Canterbury BMW M Sport H.
Spihro. 3 wins at 1200m, 1400m to 2014-15 in Aust. Briccone. 2 wins at 1600m, 1650m in Aust. Art of Love. Winner at 1100m in Aust. Seraph. 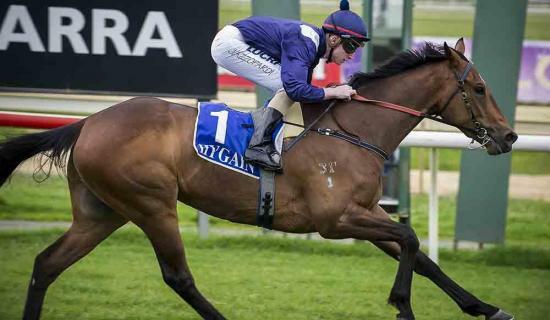 Winner at 2250m in Aust. AZMEEL (Azamour). 4 wins-2 at 2-from 7f to 10½f, Sandown Classic Trial S., Gr.3, Chester Dee S., Gr.3, Newbury Washington Singer S., L, Sandown 2YO S.
BAISSE (High Chaparral). 2 wins at 1600m, 2200m in GB and Germany, Hoppegarten Oster Stutenpreis, L.
Hurricane Floyd (Pennekamp). Winner at 2, Newmarket Express Week Of Racing 2YO S., 2d Newmarket King Charles II S., L, Royal Ascot Buckingham Palace H., York Kronenbourg 1664 H., Ramesys 2YO S., 3d Doncaster Freephone Stanley Spring Mile H., Newmarket Jim White Faucets A Lifetime in Racing H., 4th York Gimcrack S., Gr.2. ROYAL BLUE STAR (Dalakhani). 4 wins at 1m, 8½f, £675, €84,415, Cork Platinum S., L, 2d Galway Topaz Mile H.
Race Record: 8 Starts 3-2-0 A$171,240. 3 wins from 1200m to 1600m, A$171,240, in 2014-15, WATC Westspeed H., Carbon Sports Bar H., 2d WATC Sir Ernest Lee-Steere Classic, Gr.3, 4th Western Australian Guineas, Gr.2.